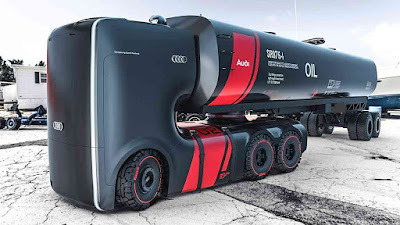 Audi's plan for the future seems very promising with its semi-autonomous and self-driving vehicle concepts and development. The company intends to make the future of trucks a brilliant one with the development of a prototype for its future truck. This is just one of the many concept designs presented for a review by Audi. Many design authors have equally presented their works to the likes of Mercedes-Benz, BMW, Peugeot and even Toyota. But then, this particular truck concept is both nerve-wracking and unbelievable at the same time. Related post: Audi sports car that changes colour and repairs itself when damaged. Primarily intended to transport heavy duty goods like oil, it rocks a sporty and futuristic look. How cool is that?! Option A is an electric truck autonomously driving on the highway. Option B is an electric truck show car. Audi decided to develop both directions to choose the best one. Plan failed. They were unable to choose the best one, so They are presenting you both versions.